Blue Hill is one of a handful of small Maine towns that have been taking bold steps to protect their local food system. In 2011, they passed an ordinance exempting their local farmers and food producers from federal and state licensure requirements when these farmers sell directly to customers. The federal government has stiffened national food safety regulations in order to address the health risks associated with industrial-scale farming. Recent widespread recalls of contaminated ground turkey, cantaloupe, eggs, and a host of other foods illustrate the serious problems at hand. These outbreaks have been linked to industrial farms with overcrowded animals and unbalanced ecosystems. The significant distance between industrial farms and consumers creates a lack of accountability and difficulty tracing problems when they arise. Small-scale farming, however, doesn’t spark the same safety risks. Small farmers who sell their food locally will tell you that the nature of their business, based on face-to face relationships with the people who eat their food, creates a built-in safety protection. They don’t need inspectors to make sure they are following good practices. Keeping their neighbors, families, and long-time customers in good health is an even better incentive. Customers are also more able to witness the farming practices firsthand. Still, small farmers are being pushed out of business because they are saddled with the financial and bureaucratic burdens of the same regulations as large industrial farms. Heather and her family’s Quill’s End Farm raise grass-fed cows, lambs, pastured pigs, chickens for eggs and meat, turkeys, dairy cows, and goats. The diverse mix is better both for the land and the economic viability of the farm. Given the scale of their business, building their own chicken processing unit was financially out of the question, so instead they were butchering at a neighboring farm’s USDA-approved unit. When state inspectors told them that USDA regulations didn’t allow them to share this neighbor’s facility, Quill’s End Farm was forced to stop raising and selling chickens altogether. 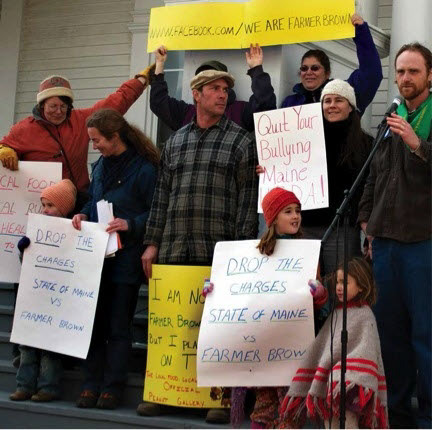 So Heather, together with a small group of other farmers and farm patrons in Maine, began crafting the Local Food and Community Self-Governance Ordinance, the ﬁrst of its kind in the country. The ordinance exempts direct sales between farmers and customers – at farms, farmstands, and markets, for example – from state and federal licensing and inspections. It allows Heather to sell chicken at her farmstore, and Bob St. Peter, a fellow farmer and organizer, to sell his homemade cookies at the farmers’ market. In March 2011, the ordinance passed unanimously in the town of Sedgwick, Maine. Three days later it was presented at Heather’s town meeting in Penobscot. “We spent a good while talking about whether to give $3,000 to our local library,” says Heather, “and I was sitting there thinking ‘Whoa, this is a tough crowd.’ But then when the ordinance came up, it was another unanimous vote. It was tremendous.” Other towns in Maine immediately followed suit. Since then, says Heather, “We’ve heard from people in Tennessee, Texas, California, Virginia… someone in New Zealand. Last year, Vermont passed a food sovereignty resolution with similar language. Over in California they’re working in the direction of an ordinance in Mendocino County. In Arizona they’re beginning to circulate petitions. 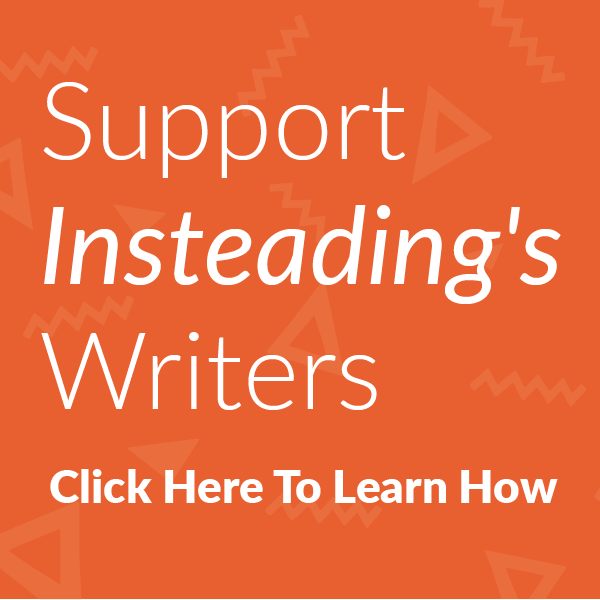 And this fall we heard that a town in Utah had passed the ordinance.” Over the two years following Sedgwick’s success, more than eight towns in Maine itself have adopted such ordinances. As of this writing, Maine’s State Department of Agriculture is challenging one of the local ordinances by suing a dairy farmer. Community members are reaching out to friends in surrounding counties and national food justice coalitions, asking them to call in and urge the state to drop the suit. The case has drawn national attention. Meanwhile, organizers from far and wide are watching closely, hoping to launch similar initiatives in their own communities. In addition to efforts at the local level, farmers and activists are attempting to tackle the government’s one-size-fits-all approach to food safety at the federal level. When US legislators voted to increase Food and Drug Administration inspections and reporting requirements for farms in 2010, more than 150 food groups succeeded in winning an amendment that provides some exemptions for small farmers. “Foodborne illnesses don’t come from family agriculture,” says Senator Jon Tester from Montana, who co-sponsored the amendment. Next article Germ Alert: Is Your Kitchen Harboring Deadly Pathogens? Germ Alert: Is Your Kitchen Harboring Deadly Pathogens?